Orexin A (OXA) is a neuropeptide implicated in the regulation of arousal status and energy metabolism. Orexin receptors are expressed not only in the central nervous system but also in the pancreas and adipose tissue. However, little is known about the physiological function of orexins. This study investigated the role of exogenous OXA in blood glucose control after glucose load in mice. In addition, the effect of OXA on insulin secretion was also identified in mouse pancreatic beta cells. Insulin secretion and intracellular Ca2+ levels were measured in perifused mouse islets. To investigate the effects of exogenous OXA on blood glucose levels in vivo, intraperitoneal glucose tolerance tests were performed after a subcutaneous injection of OXA in normal and high-fat diet-induced diabetic mice. OXA significantly potentiated glucose-stimulated insulin secretion in vitro, which increased intracellular Ca2+ levels, mainly through adenylate cyclase and ryanodine receptor activation. This Ca2+-dependent insulinotropic effect of OXA was blocked in Epac2 (Rapgef4)-deficient beta cells. After a glucose load in mice, exogenous OXA decreased blood glucose levels, compared with the control, by enhancing plasma insulin and decreasing plasma glucagon levels. Additionally, OXA caused a delayed increase in plasma leptin levels, resulting in lower plasma insulin levels when blood glucose levels fell to baseline. These results suggest that OXA might be a critical regulator of insulin, glucagon and leptin secretion in response to glucose. Thus, exogenous OXA might have therapeutic potential in improving blood glucose control in patients with type 2 diabetes. Orexin A (OXA) and orexin B are hypothalamic neuropeptides implicated in the regulation of appetite and arousal status in the central nervous system . Narcolepsy is associated with a decrease in the expression of hypothalamic orexin, compared with healthy controls , and is also associated with obesity and type 2 diabetes [3, 4, 5, 6]. In addition, hypothalamic prepro-orexin mRNA levels are reduced in genetically obese ob/ob and db/db mice , and the deletion of orexin induces obesity and insulin resistance in mice . These observations suggest that orexins play a role in the regulation of glucose homeostasis and energy metabolism. Orexins interact with two G-protein-coupled receptor subtypes: orexin receptor 1 (OXR1) and OXR2 . OXRs have been demonstrated not only in central neurons but also in some peripheral endocrine cells. Recent studies have demonstrated that OXR1 is expressed in the pancreatic alpha and beta cells of pigs, rats and mice [9, 10, 11] and in human and rat adipocytes [12, 13]. Therefore, it is likely that orexins contribute to important endocrine functions. A number of studies have reported the effects of OXA on insulin secretion and blood glucose levels in vivo and in vitro. In the fasting state, OXA potently inhibits glucagon secretion in perfused rat pancreas  and rats in vivo . Consistently, OXA decreases blood glucose levels in fasting mice . However, conflicting findings have been reported on the effect of OXA on insulin secretion in the fasting state in vivo [14, 15, 16, 17]. A recent study demonstrated that OXA potentiates glucose-stimulated insulin secretion (GSIS) in perfused rat pancreas . However, little is known about the mechanism of OXA’s action in GSIS and the role of OXA in the regulation of blood glucose levels after a glucose load. Leptin is an adipokine that affects insulin secretion and potently inhibits food consumption , in contrast to OXA, which is known to stimulate food intake at the level of the central nervous system [19, 20]. Moreover, leptin potently inhibits insulin secretion [21, 22, 23] whereas OXA exerts the opposite effect . These findings suggest that leptin and orexins are strongly correlated with each other and that they have counteracting roles in the regulation of appetite and plasma insulin levels. Therefore, we investigated the role of OXA, which may act in concert with insulin and leptin, in the regulation of blood glucose levels after a glucose load in mice. In addition, we also examined the effect of OXA on GSIS, as well as the underlying mechanisms, in pancreatic beta cells. FBS and RPMI 1640 medium were purchased from Life Technologies (Carlsbad, CA, USA). OXA peptides, SB334867, JNJ10397049, U73122 and GF109203X were from Torcris Bioscience (Bristol, UK). H-89, xestospongin C and dantrolene sodium were from Cayman Chemical (Ann Arbor, MI, USA). MDL12330A was purchased from Biomol (Plymouth Meeting, PA, USA). All other chemicals were obtained from Sigma-Aldrich (St Louis, MO, USA). C57BL/6 (wild-type; WT) male mice were purchased from Jung-Ang Experimental Animals (Seoul, Korea). Epac2 knockout (KO) mice were a kind gift from S. Seino (Kobe University Graduate School of Medicine, Kobe, Japan). The Epac2 KO mice were generated by placing tandemly oriented loxP sites around a 1.3 kb DNA fragment that contained a portion of exon 1 and intron 1 from the mouse Epac2 gene; the fragment was subsequently removed using Cre recombinase. The lack of Epac2 expression in the pancreatic islets of the Epac2 KO mice was confirmed using an RT-PCR analysis (data not shown). The mice were housed under a daily 12 h light–dark cycle and fed on a commercial normal chow diet (Research Diet, New Brunswick, NJ, USA) with 10% of energy from fat, 70% from carbohydrate and 20% from protein. The Keimyung University Institutional Ethics Committee (Daegu, Korea) approved all animal experiments (KM-2013-75). To induce a model of type 2 diabetes, 5-week-old C57BL/6 mice were fed a high-fat diet (HFD) (Research Diet) with 60% of energy from fat, 20% from carbohydrate, 20% from protein, for 8 weeks. An intraperitoneal glucose tolerance test (IPGTT) was performed on normal or HFD-induced diabetic (HID) mice. On test days, the mice were fasted for 12 h and then given a subcutaneous injection of OXA (16 nmol/kg) or 0.2 ml of the saline vehicle (154 mmol/l NaCl). A subcutaneous administration was chosen to achieve a slow rate of peptide absorption. After 30 min, the mice were given an intraperitoneal injection of glucose (500 mg/kg). Blood glucose levels were measured from tail blood samples collected at 0, 15, 30, 60, 90, 120, 180 and 240 min after the glucose treatment using the Glucocard Test Strip II (Arkray, Kyoto, Japan). Plasma glucagon, insulin, leptin and OXA levels were measured from orbital venous plexus blood samples using the ultrasensitive glucagon (Biovision, Milpitas, CA, USA), ultrasensitive insulin (Mercodia, Uppsala, Sweden) and leptin (Raybiotech, Norcross, GA, USA) ELISA kits and OXA (Phoenix Pharmaceuticals, Burlingame, CA, USA) chemiluminescent ELISA kit, respectively. Mouse pancreatic islets were isolated using a collagenase digestion technique. To collect dispersed islet cells, the islets were incubated in 1 ml of Accutase solution (Innovative Cell Technologies, San Diego, CA, USA) for 15 min at 37°C, and the cells were pipetted up and down gently 15–20 times to promote dissociation. The islets and dispersed islet cells were incubated in RPMI 1640 medium containing 5.6 mmol/l glucose and 10% FBS within a humidified incubator at 37°C with 5% CO2 for 12 h. The dispersed islet cells were stained with insulin antibody to confirm the purity of beta cells. The beta cells were used for the measurement of intracellular Ca2+ concentration ([Ca2+]i). The islet homogenates were subjected to SDS-PAGE and immunoblotted with anti-EPAC2 (Cell Signaling, Danvers, MA, USA), anti-OXR1 (Abcam, Cambridge, UK), anti-OXR2 (Abcam), anti-insulin (Santa Cruz Biotechnology, Santa Cruz, CA, USA) and anti-beta actin (Sigma-Aldrich) antibodies. The immunoreactive bands were visualised using a horseradish peroxidase-conjugated secondary antibody (Abcam) and enhanced chemiluminescence (Amersham Biosciences, Little Chalfont, UK). The experiments were repeated at least three times. Static insulin secretion in the islets was measured using batch incubations. Ten size-matched islets were incubated in independent batches. The islets were incubated for 30 min at 37°C in Krebs–Ringer phosphate–HEPES (KRPH) buffer (10 mmol/l phosphate buffer [pH 7.4], 1 mmol/l MgSO4, 1 mmol/l CaCl2, 136 mmol/l NaCl, 4.7 mmol/l KCl and 10 mmol/l HEPES [pH 7.6]) containing 0.2% BSA and 2.8 mmol/l glucose. The islets were stimulated with 16.7 mmol/l glucose for 30 min, with or without 10 nmol/l OXA. After the incubation period, aliquots of the medium were collected. The supernatant fractions (200 μl) were collected and stored at −20°C for subsequent analysis. Dynamic insulin secretion in perifusates was measured using an automated perifusion system. Briefly, a low-pulsatility peristaltic pump pushed the KRPH buffer containing 2.8 mmol/l glucose at a perifusion rate of 100 μl/min through a perifusion chamber (Biorep Technologies, Miami, FL, USA) containing 100 pancreatic islets immobilised in Bio-Gel P-4 Gel (Bio-Rad, Hercules, CA, USA). 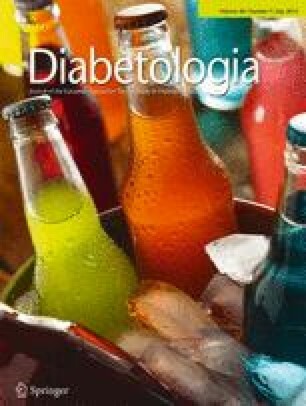 After a 30 min stabilisation period, the groups of islets were successively stimulated with 16.7 mmol/l glucose and 10 nmol/l OXA. The perifusate was collected in an automatic fraction collector. The perifusion chamber containing the islets was kept at 37°C and the perifusate solutions were gassed with 95% O2 and 5% CO2 and maintained at 37°C. Perifusates were collected every minute. The cAMP content in the islets was measured according to the manufacturer’s instructions for the cAMP enzyme immunoassay system (R&D Systems, Minneapolis, MN, USA) in the presence of 16.7 mmol/l glucose. The islets were pre-incubated with an RPMI buffer containing 500 μmol/l isobutyl-methyl xanthine and 10 mmol/l MgCl2 at 37°C for 20 min. The islets were then stimulated for 30 min at 37°C in a buffer that contained OXA (10 nmol/l) or forskolin (10 μmol/l). The optical density for each treatment was determined immediately using a microplate reader at 405 nm with the wavelength correction set at 570 nm. The cAMP levels were normalised to the protein concentration. The ATP content in the islets was measured according to the manufacturer’s instructions for the luciferase assay (Invitrogen, Carlsbad, CA, USA). Twenty islets were used for ATP measurements in each batch. The islets were incubated for 2 h in KRPH buffer containing 2.8 mmol/l glucose and then exposed to 16.7 mmol/l glucose and 10 nmol/l OXA for 30 min at 37°C. The ATP levels were normalised to the protein concentration. Changes in [Ca2+]i were determined using a confocal laser microscope (LSM 5 EXCITER; Carl Zeiss, Jena, Germany). The excitation and emission wavelengths for the detection of Ca2+ were 488 and 516 nm, respectively. The fluorescence images were collected at intervals of 3 s and analysed using LSM5 software version 4.2 (Carl Zeiss). The chemical reagents were applied using a flow system with a flow rate of approximately 1 ml/min at 37°C. The primary pancreatic beta cells were loaded with the Ca2+-sensitive dye fluo-4/acetoxymethyl ester (3 μmol/l; Molecular Probes, Eugene, OR, USA) in a KRPH buffer containing 2.8 mmol/l glucose for 30 min. The cells were then incubated for 20 min in a dye-free solution to enable the esterase cleavage of fluo-4/acetoxymethyl ester to liberate fluo-4. After the establishment of a stable baseline [Ca2+]i level, the cells were stimulated with 16.7 mmol/l glucose for 5 min, followed by 10 nmol/l OXA for 5 min. The results were plotted as the change in fluorescence intensity and the magnitude was calculated as the change in fluorescence intensity, expressed as a percentage of the basal fluorescence intensity (F0). Results were expressed as the mean ± SEM. SPSS version 20.0 (SPSS, Chicago, IL, USA) was used for statistical analyses. The AUC was calculated using Microcal Origin software version 9.1 (Northampton, MA, USA). Comparisons between the two groups were performed using a Student’s two-tailed t test. For comparisons involving more than two groups, the significance was tested using ANOVA with Bonferroni correction. Statistical significance was set at p < 0.05. We investigated the effect of OXA on GSIS and determined the expression of OXR1 in mouse pancreatic islets in vitro. Thus, by western blot analysis, we identified a single OXR1 band of 52 kDa in protein lysates prepared from hand-picked and highly purified islets (Fig. 1a). In addition, OXA induced a dose-dependent increase in GSIS (Fig. 1b). Pretreatment with the specific OXR1 antagonist SB334867, phospholipase C (PLC) inhibitor U73122 or protein kinase C (PKC) inhibitor GF109203X blocked the stimulatory effect of OXA on GSIS, whereas pretreatment with the specific OXR2 antagonist JNJ10397049 had no such effect (Fig. 1d). Although OXA-mediated changes in cellular ATP levels were not observed (Fig. 1c), OXA augmented cellular cAMP levels compared with the control (Fig. 1e). Pretreatment with the OXR1 antagonist, PLC inhibitor, PKC inhibitor or adenylate cyclase (AC) inhibitor MDL12330A blocked the stimulatory effect of OXA on cAMP (Fig. 1e). To investigate the downstream signalling mechanism following the OXA-induced cAMP increase, glucose-stimulated [Ca2+]i changes were measured in the presence of various cAMP signalling pathway inhibitors in the primary beta cells. OXA further increased the [Ca2+]i levels in response to high glucose (Fig. 2a). As shown in Fig. 2b, the stimulatory effect of OXA on [Ca2+]i was not observed in the presence of the PLC inhibitor, PKC inhibitor or AC inhibitor or in the presence of H-89 (a non-selective inhibitor of protein kinase A [PKA]) or brefeldin-A (BFA; a non-selective inhibitor of exchange protein activated by cAMP [EPAC]) [24, 25]. However, the involvement of EPAC signalling, compared with that of PKA, was more predominant for the stimulatory effect of OXA on the glucose-stimulated [Ca2+]i increase. Because the activation of the Ins(1,4,5)P3 receptor (IP3R) in response to cAMP signalling is a PKA-dependent mechanism and the activation of ryanodine receptors (RyRs) is an EPAC-dependent mechanism [26, 27], we next investigated the effect of OXA on glucose-stimulated [Ca2+]i increase in the presence of the IP3R antagonist xestospongin C and the RyR antagonist dantrolene sodium. The stimulatory effect of OXA on [Ca2+]i was remarkably reduced not only in the presence of the RyR antagonist but also in the presence of the IP3R antagonist (Fig. 2c, d). However, the involvement of RyR signalling was more predominant than the involvement of IP3R signalling for the stimulatory effect of OXA on the [Ca2+]i increase. We next investigated the signalling mechanism for the stimulatory effect of OXA on GSIS in the presence of various inhibitors of the cAMP signalling pathway in the primary islets. As shown in Fig. 3, the stimulatory effect of OXA on GSIS was not observed in the presence of the OXR1 antagonist, AC inhibitor, PKA inhibitor, EPAC inhibitor or RyR antagonist. However, the involvement of EPAC–RyR signalling was found to be more predominant than that of PKA signalling for the stimulatory effect of OXA on GSIS. To confirm the involvement of the EPAC signalling pathway in the stimulatory effect of OXA on GSIS, Epac2 KO mouse islets were used (Fig. 4a). OXA-induced cAMP increase was not reduced in Epac2-deficient islets (Fig. 4b). As expected, OXA-induced increases in [Ca2+]i and GSIS (Fig. 4c, d) were dramatically reduced in Epac2-deficient beta cells and islets, respectively. Next, the role of OXA in the insulin secretion phase was investigated using perifused mouse islets. OXA strongly increased both first and second phases of GSIS (Fig. 4e). Moreover, the OXA-induced increase during both phases of insulin secretion was dramatically reduced in Epac2 KO mouse islets (Fig. 4f). To investigate the effect of exogenous OXA on blood glucose levels in vivo, an extended IPGTT (over 4 h) was performed following a subcutaneous injection of OXA in normal mice. The plasma levels of OXA increased approximately 30 min after OXA injection (Fig. 5a). After the glucose load, the OXA-treated group showed significantly decreased blood glucose levels compared with the control (Fig. 5b), which was correlated with an increase in plasma insulin levels (Fig. 5c) and a reduction in plasma glucagon levels (Fig. 5d) compared with the control. Interestingly, exogenous OXA also increased plasma leptin levels significantly compared with the control at 2–4 h after the glucose load (Fig. 5e); this leptin response was rather delayed and sustained compared with the insulin increase and glucagon decrease. Consistent with this, at 4 h after the glucose load, plasma insulin and blood glucose levels in the OXA-treated group were significantly lower and higher, respectively, compared with the control. To evaluate the therapeutic potential of exogenous OXA in type 2 diabetes, an extended IPGTT was also performed in vivo following a subcutaneous injection of OXA in HID mice. OXA-treated mice showed improved glucose tolerance compared with control diabetic mice (Fig. 6a). In addition, an OXA-induced time-dependent potentiation of insulin and leptin secretion in response to high glucose was also observed in the diabetic mice (Fig. 6b, c). The principal finding of this study was that OXA potentiated GSIS both in vitro and in vivo. Our in vitro experiments demonstrated that OXA increased cAMP levels through its binding to OXR1, which in turn potentiated glucose-stimulated [Ca2+]i increase via EPAC2 in mouse beta cells. The activated EPAC2 subsequently interacted with RyRs, which stimulated the release of Ca2+ from intracellular Ca2+ stores. This effect of OXA on the glucose-stimulated [Ca2+]i increase potentiated GSIS. Moreover, our in vivo experiments demonstrated that exogenous OXA improved glucose tolerance via an increase in plasma insulin and leptin levels after a glucose load in mice, in addition to its effect of decreasing plasma glucagon levels . Our proposed mechanism for the role of exogenous OXA in regulating blood glucose levels and its effects on insulin, glucagon and leptin secretion in beta cells is shown in Fig. 7. Previous studies have demonstrated that OXR1 is clearly expressed in pancreatic islets and beta cells of pigs, rats and mice [9, 10, 11]. Here, we showed that OXA influenced insulin secretion in pancreatic islets through OXR1, but not OXR2. Of note, we did not detect OXR2 expression in mouse pancreatic islets. In addition, OXR1 has been shown to have a higher affinity for OXA . In neuronal cells, OXR1 is coupled with the Gq class of G-proteins, resulting in the activation of PLC and the subsequent trigger of the phosphatidylinositol cascade . Holmqvist et al  showed that OXA increases cellular cAMP levels through activation of PKC via Gq-mediated PLC stimulation in recombinant ovary cells. Consistent with these reports, the current study demonstrated that OXA increased the cAMP levels in pancreatic islets, which could be dependent on the Gq–PLC–PKC signalling pathway. The increased cAMP levels in beta cells most likely activate the downstream signalling of PKA  and EPAC2 [26, 31]. Consistent with these data, we found that the stimulatory effects of OXA on the glucose-stimulated [Ca2+]i increase and insulin secretion were dependent on both PKA and EPAC2, although cAMP–EPAC2–RyR signalling was more predominant than cAMP–PKA signalling. Furthermore, OXA failed to potentiate GSIS in Epac2-deficient islets. Exogenous OXA potently inhibits glucagon secretion in the fasting state [11, 14]. However, little is known about the physiological roles of OXA in the fasting state. We demonstrated that plasma glucagon levels were decreased by exogenous OXA even in the fed state. Recently, Arafat et al  demonstrated that glucagon suppressed, whereas insulin stimulated, OXA secretion in humans. This report suggests that the physiological actions of OXA are suppressed by glucagon in the fasting state and activated by insulin in the fed state. Consistent with this hypothesis, the current study demonstrated that exogenous OXA improved glucose tolerance by increasing plasma insulin levels and decreasing plasma glucagon levels during the fed state. As an additional novel finding, we also demonstrated that OXA employs leptin in response to high glucose: OXA caused a long-lasting increase in plasma leptin levels from 2 h after glucose load. Late-onset sustained leptin secretion by OXA can help to utilise fatty acids and prevent unexpected hypoglycaemia possibly via the inhibition of excessive insulin secretion [21, 22, 23]. Consistent with our data, Switonska et al  demonstrated that OXA significantly elevated leptin blood concentrations in fasted rats. However, additional studies are needed to evaluate the mechanism underlying the effect of OXA on leptin secretion in adipose tissue. A reduction in plasma OXA levels has been identified in rat  and mouse  models of obesity and type 2 diabetes and in obese humans with type 2 diabetes . Interestingly, we observed that exogenous OXA markedly improved glucose tolerance in HID mice via potentiation of insulin and leptin secretion. As a physiological regulator in the control of insulin, glucagon and leptin secretion, OXA might have therapeutic potential in patients with type 2 diabetes. However, additional studies are needed to evaluate the effect of exogenous OXA on blood glucose levels in the fasting state in vivo. We are grateful to H. C. Cho (Keimyung University School of Medicine) and Y. W. Kim (Yeungnam University School of Medicine, Daegu, Korea) for their helpful discussion on this study. We specially thank S. Seino (Kobe University Graduate School of Medicine, Kobe, Japan) for providing Epac2 KO mice. This study was supported by the Basic Science Research Program through the National Research Foundation of Korea (NRF) Grant funded by the Ministry of Education (NRF-2013R1A1A4A01008364) and by the Korean Government (MSIP) (NRF-2014R1A5A2010008). JHP, HMS and AYN made substantial contributions to study conception and design, the acquisition, analysis and interpretation of data and the drafting of the article. JHB and SSI contributed to the study design and reviewed, edited and critically revised the manuscript. DKS made substantial contributions to study conception and design, the analysis and interpretation of data and revised this article critically for important intellectual content. All authors gave final approval of the current version to be published. JHP and DKS are responsible for the integrity of the work as a whole.